How to use "Deixar" in Portuguese and how not to blow it today with a dream. If you want to learn Portuguese with Rafa click here to see what I mean. Today I would like to talk to you about the idea of "change" and "transformation", and how it relates to you having more success with your Portuguese. This is mainly because lately I have been receiving a big number of emails from some of you who think learning Portuguese is difficult. When I say "change" or "transformation" I mean something very crucial, yet very difficult to describe at the same time. In order for you to understand what I mean by "change" and "transformation", you need to be prepared to understand two mind-blowing truths first, because without understanding these truths, you'll never know what you need to do to "change" and "transform" your mindset. The truth number one is that your mind is controlled by your fear. The truth number two is that your fear is controlled by your mind. But, you may be thinking, What is he talking about? When I say that your mind is controlled by your fear, I mean the fear you have to start or restart your learning. Have you ever thought about all those reactions every one of us has when we need to start a new project? "Oh, I don't know if I'll manage..."
"No! That's not for me, but if I was like him..."
"I wish I was like her with a flair for languages..."
"No, it's too expensive. I can't afford it!" "Wow, I wish I could go to Brazil or Portugal and be able to speak with them everything I wanted..."
You see? Our mind is controlled by fears that make us believe we can't do it. But you know what? Yes we CAN! Our mind, at the same time, controls this fear and feeds it. This fear and our mind are actually pulling the strings behind the scenes, and most of the time we are not aware of it! Once in a blue moon we eventually wake up and for a moment realise we are out of control, and suddenly want to do something about it. Often is too difficult for us to face this and we tend to throw it to the back of our heads and postpone the action needed. But if you want to move forward with your life, if you want to transform yourself into a naturally fluent Portuguese speaker, the kind of person that can talk to everybody without fear, you have no other choice than roll up your sleeves and do it! Imagine how many opportunities people miss everyday. How many people we could start talking Portuguese with every single day? You may be thinking... "Well I don't know any Portuguese speakers...."
Hey, right now we are all watching the World Cup, or hearing about it. There are many Portuguese, Brazilians, Angolans, etc. out there showing their flags, shirts and scarfs as a symbol of their pride for being Portuguese or Brazilians. They will for sure welcome you who wants to speak their language. They are out there, in Pubs, coffee shops, restaurants, bars, in the streets, everywhere! And with symbols saying "come and talk to me!" Go and approach them! Go and talk to them! Without that fear controlling your mind and without a fear controlled by your mind! They will love you being with them! You'll be one of them! One more person supporting their team. Then, when you are with them, you can learn what they are saying. Take a small notepad with you and write down what you hear, what you think is important and can have an impact when you talk back to them. Learn the words that they would like to hear from your mouth, for instance "Força Portugal! ", "Força Brasil!" - Come on Portugal!, Come on Brazil!. You see, what a great opportunity to learn...! Sometimes we also say... "Oh! It's too expensive! I can't afford it! When it comes to money, have you ever thought about all the money we spend in things we don't really need? Things we won't use after a week or two? Things we soon realise are useless? So, take some of that money, put it aside and buy a language programme, or book some Portuguese lessons. The knowledge you'll get from it will stay with you forever! This is money well spent! Discipline is another matter we need to face here. In fact, many times you may dream... "Well one day we'll be fluent in Portuguese... I'll start, or I'll continue my learning tomorrow or very soon..."
Let me tell you this: When we think like this, we are out of control! I don't mean we are out of control as we are insane, or we are going to do crazy things, but what I mean is that we have drives inside of us that have been in our genes for thousands of years, which have a powerful influence in the way we think, feel and do, which justify our fear and laziness in our minds. In a way that attracts knowledge to them, and puts them in the driver's seat of their lives. Think about something you could do every day to enhance your fluency in Portuguese. If you are, congratulations! You may be feeling the good results by now! But if you are not and if you want to learn a shocking way to start doing it, read on. Pick the most expensive or valuable thing you have in your possession. Pick that special object you wouldn't give away for nothing in this world. Put is inside of a box and give it to a friend without letting him/her know what is inside. Then tell them that when you stop doing what you need to do, they can open the box and keep what is inside - that precious object - for themselves. You see, you'd quickly realise that if you don't learn something in Portuguese every day you will loose that treasure. This way, you create discipline. You can also apply this technique to everything in your life, but if you really want to learn Portuguese you can start doing it today! So, come on! What are you waiting for?! Lately I have also received a great deal of emails from some of you who are really working on being in control of your lives and of your learning. I'll share with you two of these emails today. Hey, if you have any questions, please do not hesitate to ask me. The question you have may help many others too. I have really enjoyed using your site. I have been trying to learn how to speak Portuguese for my whole life. My mother speaks Portuguese, and so I have heard her and my uncles for as long as I can remember. There are of course some phrases that I know what they are saying, because they have always said them to us kids, but my Portuguese has always been poor. But now that you have "laid it out" the grammar of how it all goes seems much clearer to me. A lot of the "blank" parts now make sense. So thank you so much! I learned A LOT! Sincerely! I will continue to use this site and I can't wait to show my sister's brother, and all of my cousins. Muito obrigada! Buz. A question: It seems that the verb Deixar has many meanings and it's used in many contexts. Sometimes I get confused. Could you please explain? I'm glad you want to recover the Portuguese language that, as you said, is a bit forgotten. I'm glad you found me because my aim is exactly that - to help you learn Portuguese, and speak Portuguese fluently. Indeed! Verb "Deixar" is one of those very important verbs in Portuguese, and it's used in various contexts. The good news is that it's a regular verb in AR, so you can conjugate verb "Deixar" using the patterns (like verb FALAR) I give you on this verb table. Besides, verb "deixar" may get different meanings if it's followed by a preposition (a little word after it such as "de", "em, "a", etc). Let me explain... [Deixe-me explicar... ;-)] ...the most common meanings of "Deixar". You can use verb "Deixar" to express the idea of leaving, quitting, resigning, stopping, placing, releasing, etc. The fact it has so many meanings is the reason why this verb is used in so many different contexts. - To let - Ela deixou o António entrar - She let Antonio in. - To resign - Tu deixaste a empresa para onde trabalhavas? - Did you resign/leave the company you were working for? - To leave a place or something - Ele deixou a casa e a familia e foi viver no estrangeiro - He left his house and family and went to live abroad. - To leave someone alone - Deixe-me em paz! - Leave me alone! - To place / to put - nós deixámos o dinheiro em cima da mesa - We placed / put / left the money on the table. - To put aside / keep - Ela deixou algum dinheiro para as férias. - She put some money aside for her holidays. - To leave something behind - Ela deixou as chaves em casa - She left her keys at home. - To let go something you are holding in your hand - Deixe! É muito pesado. - Leave it! It's very heavy. You see? This is definitely a verb to learn and use a lot. Rafa, thank you and keep up the good work! I have one question. In 3 weeks I'm going to Lisbon for 2 days because of my boyfriend's brother's wedding. I have only met my boyfriend's parents once and never met the brother or anyone else at the wedding reception, mostly relatives I presume. Which pronoun should I use when I talk to these people? Boas Isabelle! Obrigado pelo email. With your brother-in-law-to-be you should use the pronoun "tu" unless he's much much older than you, but even though I think "tu" would be appropriate. With your boyfriend's parents it's always good if you start with "O senhor + first name or surname" if you talk to his dad, and "A Dona + first name" if you talk to his mom. They will probably treat you by "tu" in return but that's because you are younger than them. In a later stage they might let/invite you treat them by "tu" as well, but the initiative has to come from them. This issue is culturally heavy, and that's why we need to handle this carefully. Indeed, if in doubt, you can always ask them "como o devo tratar?" when you talk to him, or "como a devo tratar?" when you talk to her - how shall I address you Sir / Madam? This is equally important for Continental or Brazilian Portuguese. I remember one day, I was in Brazil and in a conversation with an older lady I tried to address her by "você" straight away. It was amazing what she did! She actually pretended she didn't hear what I said! I repeated it twice and she had the same reaction. As we know "você" for Brazilian Portuguese is like "tu" for European Portuguese" - quite informal. It's very interesting the roll these cultural issues play when we interact with Portuguese speakers... ;-) and that's one of the reasons I believe that that when we speak another language, it make us see the world from a different perspective. Well. I think I'm going to call it a day now! Enjoy your learning and the present good weather. You will hear from me again soon, with more great news! PS 1: Questions about any topic? Success stories? Please let me know. PS 2: Also, if you were going to tell your friends ONE PIECE OF ADVICE you learned from me which has helped you to speak Portuguese... What would that be? Let me know in your email! Rafael Tavares © www.learn-portuguese-with-rafa.com. All rights reserved - 2009. 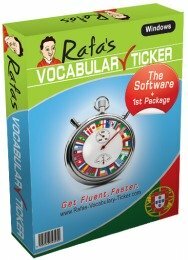 Rafa's Vocabulary Ticker Is A Language Learning Tool I've Created To Help You Get Fluent Faster. "Having found Rafa's website by accident I can honestly say it was the best thing to happen to me on my journey to learn Portuguese. I started learning on January 2012 (using a language programme) but wanted to take some classes to aid my learning. When I looked on the internet there were so many options and I felt overwhelmed but one day whilst randomly looking on different websites I found Rafa's site and thought it was the best site I had come across but when I found out he did lessons in London I was thrilled - I emailed him and he promptly responded and we arranged to meet for a coffee the next day. Rafa was so confident that I would find his lessons successful that he offered me the first lesson for free and he was right! What makes Rafa such a fantastic teacher is that not only does he explain the concepts and structure of the language in a clear, concise manner, he inspires his students with the confidence to speak and the motivation to want to learn more - I now take lessons twice a week (2 hours each time) and I always look forward to every lesson. Learning Portuguese can be extremely frustrating at times but Rafa gives you the belief that with his help and hard work you can achieve your goal. I have been really impressed with my progress since January and to put it into context - on my first lesson my only contact with Portuguese was 8 lessons on a language programme. With Rafa, we started going through the alphabet and pronunciation rules and now, three months later we are talking in Portuguese about holidays, life in London and even the socio-economic fortunes of young people in Brazil! Rafa has not only been an inspiring teacher but has become a good friend - he's always happy to answer my emails if I have questions and we often go for a coffee or beer after lessons to discuss my progress and other things of interest. If you are serious about learning Portuguese I could not recommend Rafa highly enough - he will be the difference between you giving up when the success you want is just around the corner. Jamie." - London . U.K. This site is just amazing - I really enjoy having the resource available to learn Portuguese - and have learnt so much from it already.Please keep adding more! Rafa speaks excellent English, and as a result is able to explain subtleties that other teachers can't. He can speak Portuguese clearly for the beginner or with the slang and difficult pronunciation that everyday Portuguese so often use. This is a great help. The use of Skype to conduct a lesson at a distance is great. It works absolutely fine. His site has lots of goodies and is very useful. That, combined with Rafa himself as a teacher over Skype is an excellent way to learn the language." Just wanted to thank you that you took your time and build this page. In my opinion is the best page for learning Portuguese, I just love your way of teaching! I've already taken lessons in my country but now everything seems much, much easier! "I contracted the services of Mr Rafael Tavares this summer to help me in the preparation of a series of lectures I will be giving in Mozambique. Mr Tavares managed to impart to me an incredibly clear insight to the fundamentals of Portuguese grammar and construction, which has boosted my ability and confidence enormously." Just want to say that I have found your site on learning Portuguese absolutely great! I am planning to come over to Portugal early next year to live and try to find work. Like you say it takes time to learn a language and that is true, but I do feel much more confident learning Portuguese from your site than any book, class or tapes etc... Thanks for the great site! "It's just great to learn with Rafa. His enthusiasm, dedication and humour are really inspiring and encouraging. A student could not ask for a better Portuguese teacher." Congratulations on your site, which I have just found. I began Portuguese just a few weeks ago at weekly evening class and, despite being a pretty good Spanish speaker, am finding Portuguese pronunciation hard going. Your section on this topic, plus the free lesson at front of site, are a definite help to learn Portuguese.Muito obrigado!" "I would have absolutely no hesitation whatsoever in recommending in the highest possible terms Mr Tavares to anyone wishing to learn or improve their Portuguese." "Olá! Eu queria escrever só porque gosto muito do seu site! Eu amo o português!! Eu gosto do que você escreve sobre o medo e a mente quando aprendemos línguas. Boa sorte! Gostei do seu site! "I have been deeply impressed by Rafa's structured way of teaching and his ability to identify the really key aspects for his students, thus enabling me to advance very rapidly without spending time on less important or extraneous topics." I like your page and it is very useful for me when I learn Portuguese since I get a lot of information which is easy to understand. Thank you so much for your effort. O meu nome é Jakub. Eu só queria dizer que eu estou feliz de encontrar o seu site. Acho que ele é muito bom e útil! Eu tento aprender a língua Portuguesa porque tenho muitos amigos Angolanos na minha cidade - Cracovia. And something I'm not yet able to express in Portuguese... I very much like your way of sharing knowledge and your sense of humour. Muito obrigado! Your site is a really useful resource, and I found your comparison of the personal infinitive/future subjunctive very interesting – I happened upon it precisely when I was struggling to grasp the concept, thinking I may be the only one with this problem! This is a great site! I'm a British ex-pat and I have been living in Portugal for 15 months now, but I am still struggling with the language. I've spent a lot of money on books, CDs and language lessons. I like the idea of practising my pronunciation by reading out the text but I think the text you have chosen is far too difficult. In my opinion, an easier text with more commonly used words would be more useful and make beginners feel less overwhelmed! Many thanks again, it's a great site! I love the website!!! I can see that a lot of long nights and a lot of thinking went into this site.